The Law Offices of Molly B. Kenny has been a long-time partner with Foster Web Marketing and has benefited from a number of different marketing services over the years. However, things change fast in the world of digital marketing, and it was time for the law firm to put renewed effort into freshening up its strategy. Digital Marketing Specialist Cody Moulton and our expert design team were happy to help make it happen. 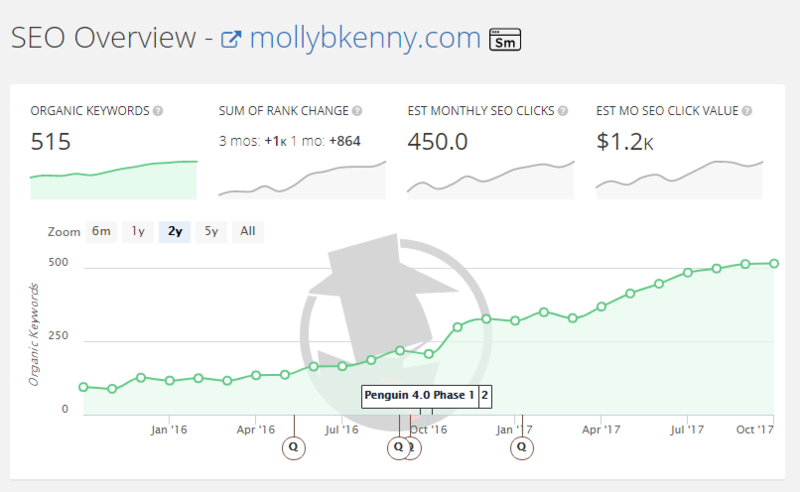 In April 2016, we started an ongoing marketing services plan for Molly B. Kenny, which consisted of content writing and SEO services. At the same time, we began to redesign her website to be more effective and more modern. Part of the challenge of this project was that the existing website needed to be completely restructured, and it needed a fresh design since it had not been updated in several years. As you can see below, however, all the effort paid off for the client in the form of a huge increase in traffic and conversions. In this day and age, it goes without saying that a fully responsive website should be easy to use, regardless of the type of device a user uses to access it. Something that looks good on both mobile and desktop is a MUST. 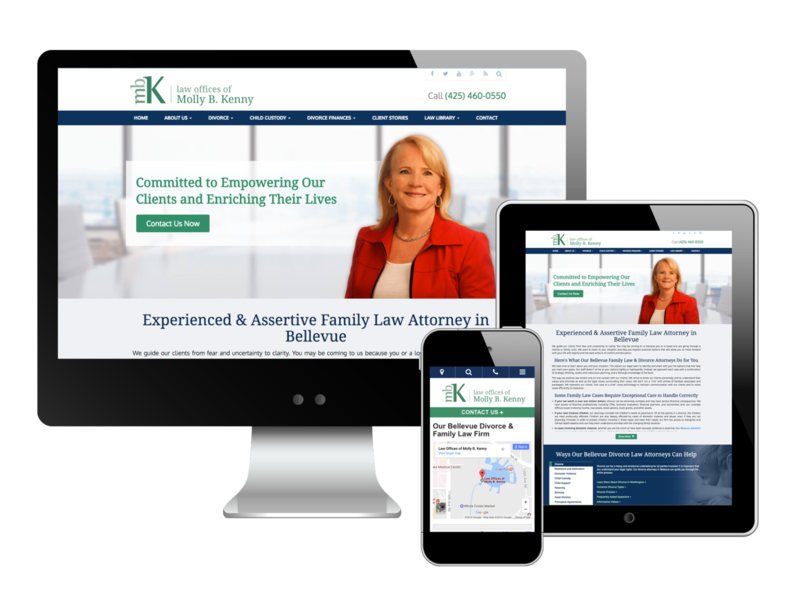 The new website for the Law Offices of Molly B. Kenny had several custom features that helped the site improve user engagement, which also helped improve overall site traffic and conversion rates. Below, you can see a breakdown of some of the biggest highlights of her website redesign. The homepage uses a panel-style design that has a modern look and feel. We also applied these custom panels to several internal pages throughout the site. Visually, the site got a complete makeover, catapulting it into the modern style of web design. Website structure is important because search engines prefer sites that make it easy to crawl and establish a hierarchy for the content. It is also very important for people visiting the website, who want to be able to quickly find the information they are looking for. We also found several ways to restructure the site to make the most important content and site sections easier to find. We even built pathways to sections of the old site that were previously nearly impossible to find without knowing they were there! For content navigation, we used historical data to make data-driven decisions about what was most popular and how to make it easier for users to find the content they want. We also identified major gaps in content on the old site that we filled in as we wrote the new design. Since the launch of the site, we’ve seen an increase of 180 percent in mobile sessions and an increase of 71 percent in desktop sessions. Mobile traffic in general has continued to increase, but we can easily attribute much of this growth to the newly favored design that is much easier to use on all device types. Once the redesign was set, Molly B. Kenny entered our monthly services plan. We were quickly able to see that a lot of on-site optimization and cleanup were needed. The bonus was that Molly B. Kenny has dedicated significant time and resources to creating helpful information for families dealing with divorce and other family matters in Washington State. Along with the fresh redesign, we had a great place to start building toward her goals. Over the years, search engines have adjusted their algorithms and raised the bar for the quality of content they are looking for. Since Molly B. Kenny has been active with digital marketing for so long, we found a lot of outdated content that was developed with outdated SEO methods in mind. To remedy the situation, we performed a complete content audit, which involved analyzing, updating, rewriting, and making informed decisions about every piece of content on her site. This effort ultimately brought her online content up to current standards for SEO best practices, and it also created a strong foundation for her content strategy moving forward. The search engines LOVED IT! We also implemented a content strategy that helps her continue to produce and publish helpful content for the potential clients the law firm is most interested in. Continually publishing new and relevant content helps build trust and engagement with readers, and search engines like to see sites that are “alive” and frequently updated. Without giving away the details of all our secret weapons, we can say that we focused on optimizing the entire website for conversions throughout the redesign and services plan. In the marketing world, this process is known as conversion rate optimization (CRO). Local SEO may not be the most exciting topic, but making sure local citations and directory listings are accurate and consistent is an important part of getting businesses to show up in local results. For Molly B. Kenny, we cleaned up numerous citations and directories that were holding her back, and we created new ones that were better suited to her goals. Are You Ready for a Complete Makeover of Your Digital Marketing? For Molly B. Kenny, all our efforts have driven toward the common goals of increasing quality and bringing in more relevant leads for her law firm. By implementing proven methods with our client’s goals in mind, we have been able to increase her website leads by 137 percent since August 2016. Do you have ideas for breathing fresh air into your digital marketing strategy? Are you ready to get started on your own site? Request a free website analysis to find out exactly what is holding your website back from reaching its potential.